Way back in April, I posted a brief history of INDIANA JONES AT MARVEL UK (follow this link to find it) which I thought, with one omission, was pretty comprehensive. Within the last week, I secured a couple of new old comics (if you follow) that fill a gap... and add a one-shot which I wasn't previously aware of. 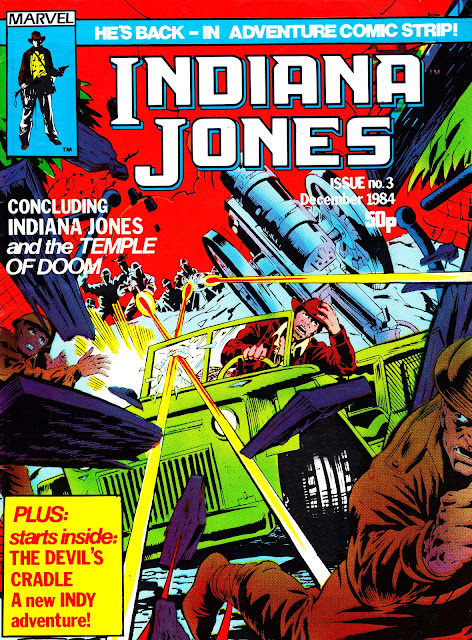 This was the only issue of the 11-issue run of INDIANA JONES Monthly that I didn't have when I posted the original article. It reprints the concluding third of Marvel's TEMPLE OF DOOM movie adaptation (already serialised in SPIDER-MAN's weekly, a swift rerun which might have dented the monthly's sales). 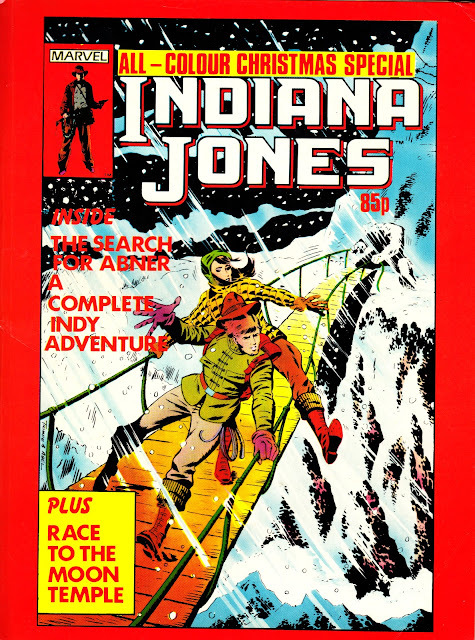 The second strip was The Devil's Cradle from THE FURTHER ADVENTURES OF INDIANA JONES issue 3, which also provides the cover artwork. When I started this blog (with the - partial - intention of chronicling Marvel's British outpost) at the beginning of the year, I was pretty sure that I was aware of most of Marvel UK's seventies and eighties output (actually owning copies is another matter) so it's always a treat when I stumble across something hitherto unknown. This is one such comic. I don't remember seeing this at the time and I've not spotted across any cross-promotion elsewhere in the Marvel UK range (sometimes - like the summer of 1985 - they promoted their specials to death, other times they barely rated a mention). It's in the album format (stiff card covers, square bound with colour interiors) and reprints the two-part The Search For Abner from THE FURTHER ADVENTURES OF INDIANA JONES issues 17 and 18 (the cover art is from the later). The Race to the Moon Temple (note the placement of that box: it covers the area where the barcode would have appeared on the original US cover design. Barcodes on comics hadn't reached the UK yet) isn't a missing adventure, it's a game printed across two interior pages. This special would have appeared somewhere around November/ December 1984, roughly contemporary with the launch issues of the monthly. It plugs the monthly inside, including offering subscriptions. Is your copy of issue 3 water damaged / wrinkled? It's fine, why do u ask? Some of my later issues in the run are a little more beat-up... But I think they were actual M-UK file copies. Some day I'll get around to explaining that. How you'd have Marvel UK file copies is intriguing. I added to your Hulk at Marvel UK discussion.